September 12, 2012 By arzea 10 Comments This post may contain affiliate links. Read my disclosure policy. I can’t believe we are already into September and fall is here! I love, love, love fall! The changing leaves, trees, pumpkins, apple picking, football games, cooler air, Halloween, apple cider, donuts, corn mazes, fall festivals….everything! I just love it. I have seen a couple Fall Bucket Lists going around and decided to make one for myself. 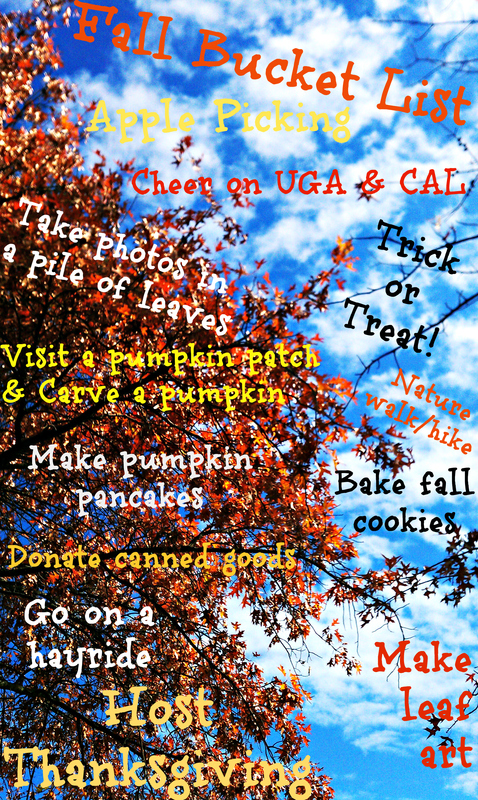 I included all of my must-do activities for fall this year! Have you made a bucket list for fall? What are you must-do activities? Love it! You’ve inspired me to make one of these of my own. Love the part about donating canned goods. Something we all need to remember to do. Thank you! I can’t wait to see yours! I need a Fall Bucket list!! Yes! Do it! Please share your link when you do! Oh! And If you make the pancakes-please write about it and the recipe! I would love to try those! 🙂 I’ve only made my regular pancakes and sweet potato ones before! I will! I am going to do the things then reference back to my list…I hope!